Success accompanies the trader who has what the rest do not have. The newest way of Internet trading using specialized software TradeChaos based on the trading strategy Profitunity. This page contains a description of the problems and methods of Internet trading on financial markets. I hope that the writing will help both users of my software, and ordinary traders who came to this site by accident. As I describe, I will give links to the user-defined indicators. They are mostly paid. But there is 100% cashback spent on them in case of buying the main product, which generates trading signals. The widget with a link to a free demo version is placed at the very end of the page. 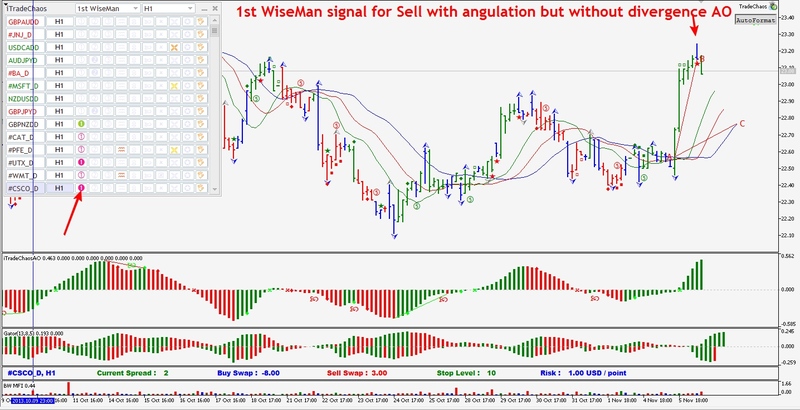 As a result of many years of research, based on a deep study of classics, authors of books on technical analysis by Bill Williams, John Bollinger, and Larry Williams, I created a semi-automatic utilities and indicators for the convenience of Internet trading on a strategy based on Bill Williams` Profitunity. A new way of trading is invented, which allows not only to trade with good profit, but also to enjoy it. The idea was implemented thanks to new possibilities for programming in the MQL5 environment. For several years iTradeChaos software products have been successfully used by traders all over the world. The trading panel “Trading Chaos Expert” and specialized indicators were introduced by financial companies and private traders in more than 80 countries around the world. Innovation lies in the technology of analyzing a large array of information, quickly searching for specified trade signals for one or a number of time frames simultaneously. Display of all found trading signals in the table for convenience of their overview for further automation of placing pending orders for entry into positions. Automation of all routine trading processes simultaneously for dozens of currency instruments and time frames. Intuitive management and advanced functionality do not leave traders indifferent. click on the line of stop-loss translates the order execution by touch or by closing. There is no “black trading boxes”. Only semiautomatic informed trading with the newest software. 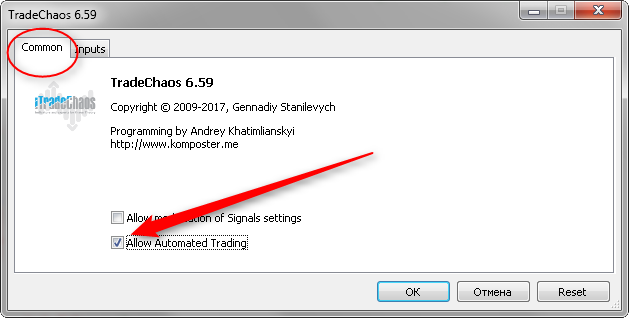 MT5 terminal setup instruction for trading using the “Trading Chaos Expert” panel. Installation and the first launch of the trading panel. The trading panel is installed on the open chart of the MT5 terminal on the VPS server or on a constantly running computer (home server) with good performance. The computer must have 8 GB of RAM and higher. I recommend a good VPS server KVM “Forsage” tariff with the operating system Windows server installed. From experience, I can say that it’s better to use your own computer or server, although it’s a bit inconvenient. MT5 trading account must be a netting one without the possibility of hedging. In order to open an account of this type, when opening an account, uncheck the box, as shown in the following figure. Or contact the technical support of the broker with the request to change the type of your trading account from Hedge to Netting. 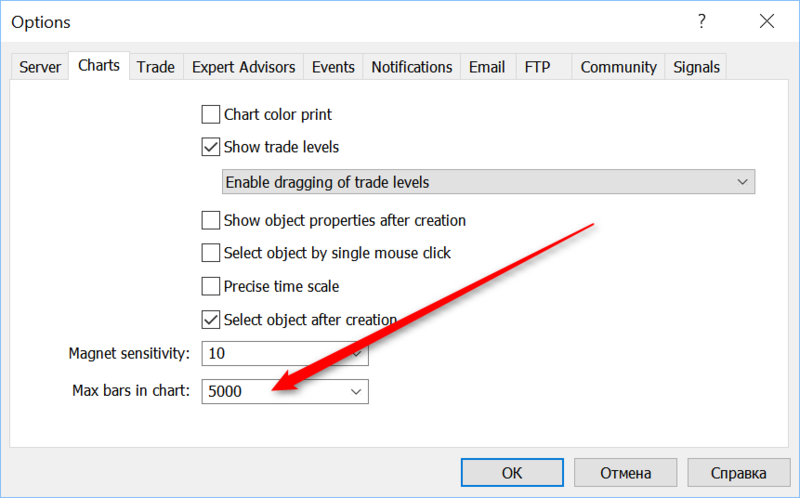 The next step is to click Tools> Options> Charts or (Ctrl + O) and adjust the desired maximum number of bars on the chart, set 5000. Please note that each used intrument and time frame consume computer memory. Each indicator on the chart will consume several times more memory. When switching between charts, MT5 does not release resources (this was done for a quick return to the data used earlier). Therefore, when working with a large number of instruments, time-frames and indicators, the terminal begins to seriously hamper. See the figure. Next, you should configure the display of objects on the chart. This is necessary for the correct display of the necessary information about the amounts of possible losses and profits that are displayed on lines corresponding to entry points, stop loss levels and take profit. To do this, right-click on the chart and select Properties (or press F8) and tick the box which is shown on the following figure. In the trading terminal, you need to set up ways to alert you when the main trading signals occur. This is necessary in order not to bother yourself with long studies of trading signals displayed in the table, and immediately inspect the chart with the financial instrument and time frame exactly at the moment when the most important information about the market state arrives, and automate the entry to the position at the most appropriate moment. In the panel installed on the server, enter the properties, then go to the “Notifications” tab. Writeyour MetaQuotes ID in the box. 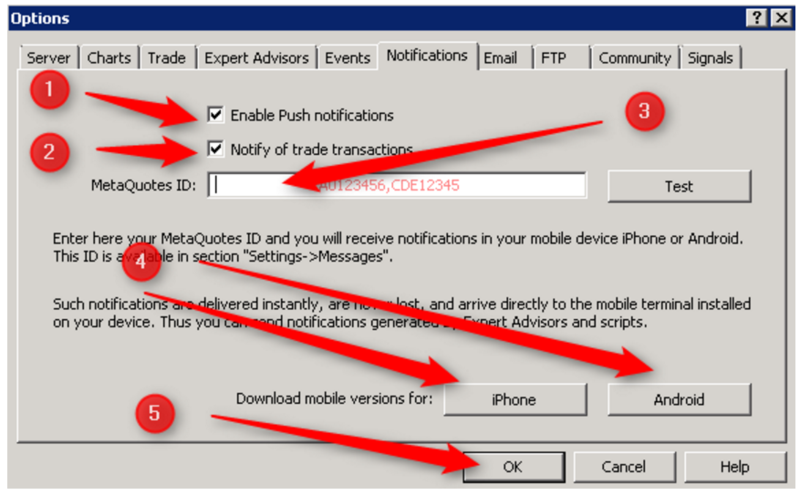 You can find out your MetaQuotes ID in the “Settings” – “Chats and messages” of the mobile terminal. Download mobile terminals: for iOS, for Android. Setting up the mail client in MT5 using the example of the hotmail.com mail service. This is in case you want to receive information about the signals by E-mail. 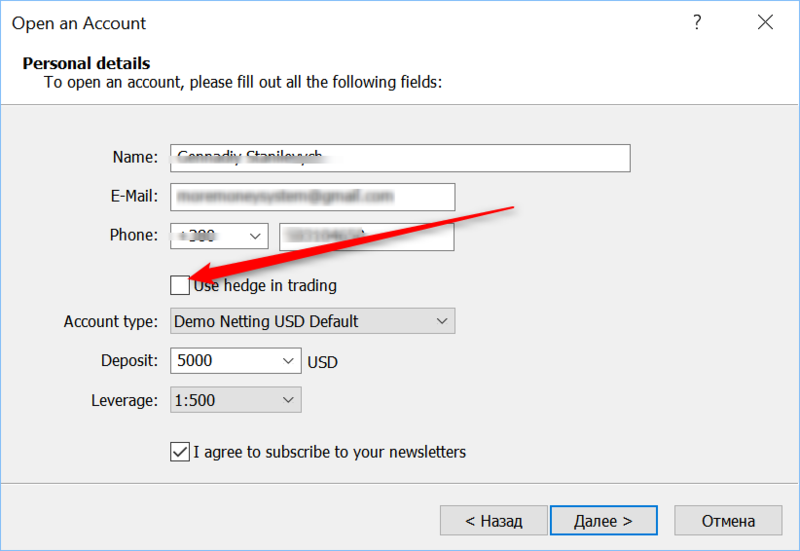 In MT5, open the Service – Settings – the Mail tab. To whom = write the address of your email. mail, to which we want to receive notifications from MT5. If you use high-frequency trading on small timeframes (less than D1), then the alert function is better set up for alerts instead of mail and push notifications. For the convenience of connecting the panel to the charts, I recommend using the “Hotkeys”. 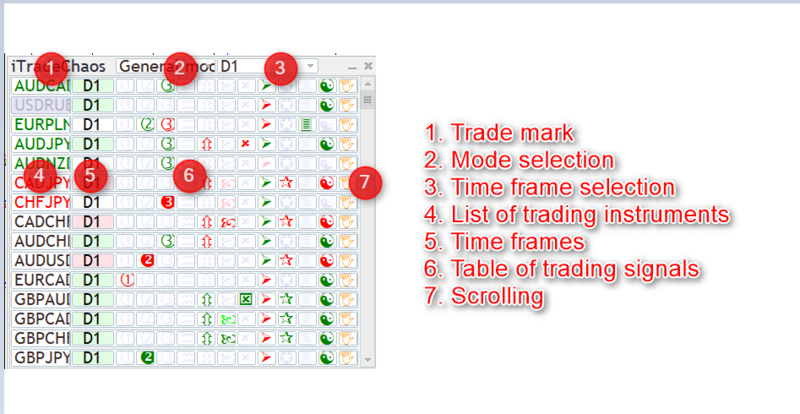 To do this, in the “Navigator” box of MT5 find the name of the trading panel Trading Chaos Expert, right-click on it, select “Hotkeys” and set, for example, Ctrl + 1. 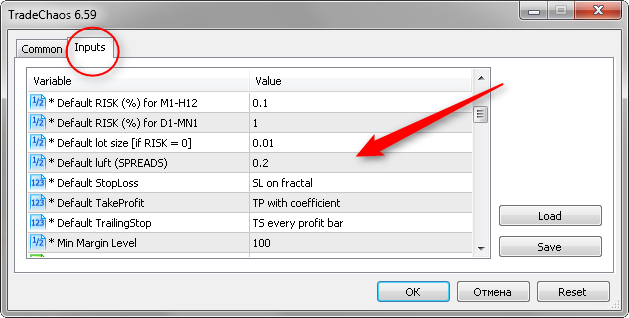 In the MT5 program interface, find “View”, then “Market Review” and display the section with trading instruments. This can also be done by pressing CTRL + M on the keyboard. Then click the right mouse button on any of the available instruments to find “Show all” and click the left mouse button. The “Market Review” will display all the tools that the broker has. Then right-click on the topmost symbol in the table and click “Chart Window”. In the new window that appears, click the right mouse button and then click on “Properties”. In the appeared window, in the middle tab, make the “Display Bid / Ask Line” window active. After clicking on the “OK” button, on the chart with a small time frame you will see two lines. These lines will show you the size of the spread on this instrument. It should be kept in mind that the greater the distance between these lines, the less the opportunity to earn on this currency instrument. If you see a “torn” chart with a lot of gaps between candles, this indicates the illiquidity of the instrument and you should not trade on it either. 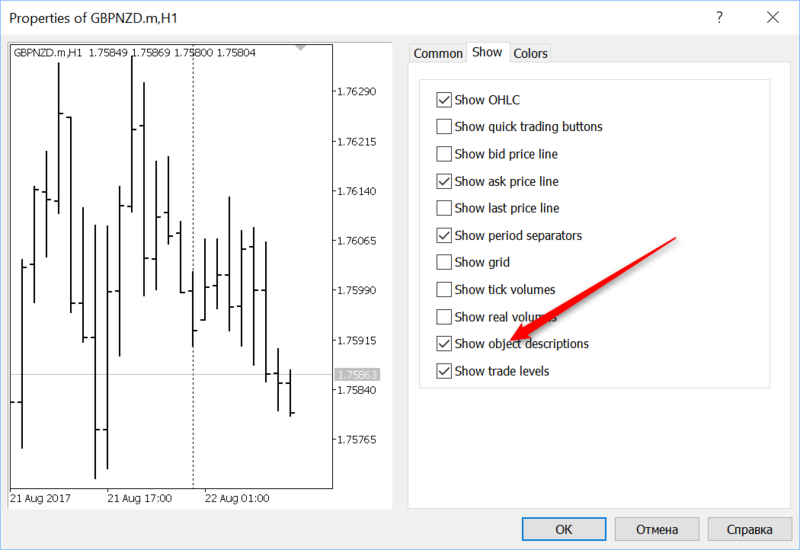 In order to quickly inspect all instruments for profitability for profit on them, download and attach to the chart the free utility Slider from the MQL5 market. Press the START button. The indicator flips through all trading instruments with the chart display period you specified in the settings, partially downloads the history of the quotes. Watch a video on how Slider works. The situation is more complicated with the parameters of trading instruments prescribed in the “Specifications”. However, a solution is also found. SpreadandSwapMonitor – informs about the size of the spread, the rollover (SWAP), the remoteness of the possible setting of the pending order and the stop-loss from the current price, the risk value of 1 point in the deposit currency, as well as the time of the authorized trade of the instrument. To our great regret, we will not see the hidden broker commission. They are not listed in the contract specification. I hope that this figure will be added to MT5 settings in the future. The SpreadandSwapMonitor indicator works fine with the Slider indicator in one template. See the video. It is impossible to make profit by entering a position with a large spread, negative rollovers, both for buying and selling, in an illiquid market with the inability to place a close stop-loss in an extremely limited time for holding trading sessions. Exclude from the list of trading tools “junk”, which offers you a broker. To do this, in the Market Review, right-click all the illiquid instruments so that it does not interfere with your profitable trade! Also do not forget abuout the convenience of MT5 platfom to display the necessary icons in the program interface. To do this, right-click on the icon area and select “Settings” from the menu that appears. Next, turn on the display of the most necessary icons. Namely, “Indicators”, “Templates”, “Navigator”, Market Watch “, etc. Now, open a new chart with any trading tool. This can be done in two ways. The first way. In the “Market Watch”, hold the currency pair with the left mouse button and drag it to the right. Second, right-click in the quote area and in the resulting list of tasks, click “Chart Window”. 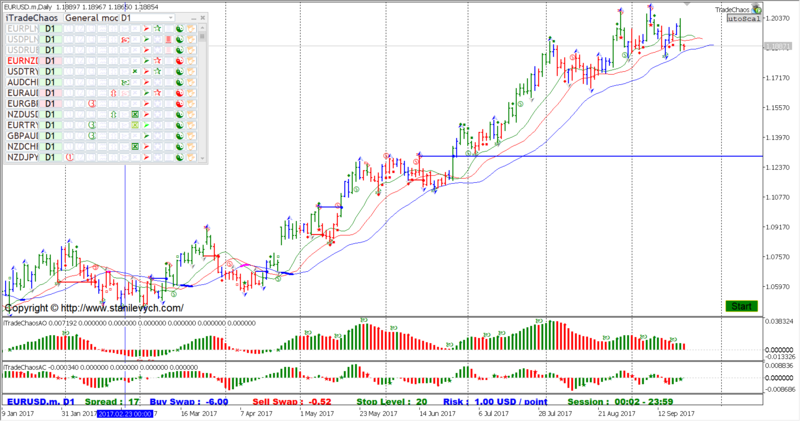 In the MT5 program interface, click the Auto Trader button. It should be green. After clicking OK button in the top left corner of the chart, a panel will appear which will automatically start loading the history of quotations for all trading instruments that you left in the “market watch” of the terminal. At the first start of the panel, due to complete absence of the history of quotations, this process can take quite a long time. 15 minutes to go. The percentage of completion of the task will be indicated in the trading panel. By default, the first daily quotes are downloaded. After the quotes have been fully downloaded, the panel will analyze them in a few seconds and display a table of trading signals. The ability to select the mode of searching for trading signals and time frames allows the trader to group and filter out the favorite patterns on multiple periods. Symbols of trading signals in the panel. The red color of the icon means a sell signal, the green color indicates a buy signal. Not bright colors of icons correspond to preliminary trading signals on an unclosed period. Bright and saturated colors – formed trading signals. Preliminary signals are provided in order to give the trader time to prepare for a market signal. Give an opportunity to evaluate it from the technical analysis point of view. The panel allows you to put a pending order to a pre-signal. If the preliminary signal does not take place, the panel itself will cancel the issued order. – The “First wiseman”. Divergent reversal bar. – The “Second wiseman”. Three or more consecutive bars of the histogram of the AO indicator. – The “Third wiseman”. Fractal signal. 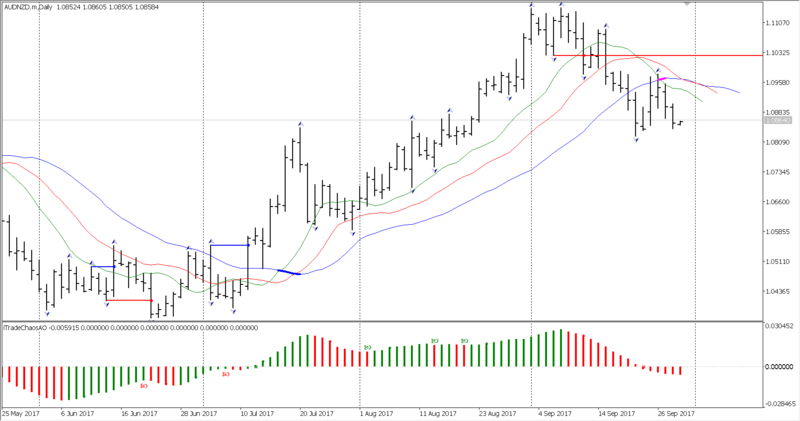 – Divergence of price and indications of the histogram of the AO indicator. – The beginning of zoning. – A saucer trading signal. – Cross. The intersection of the zero line histogram. Special blue light. – Breakdown of the Bollinger Band. Volatility breakthrough. – Push and revers signals. – Change of trend. Overcoming the fractal level. – Management of transactions. Changing the item settings. The current symbol and the period of the chart are highlighted with a darker background. When you click on the title TF (opposite any symbol), you switch to the selected chart. When you click on the icon of any of the signals, an additional panel opens with trade specifications. Specify the necessary parameters, and click Apply, all parameters will be saved (and will be restored when the Expert Advisor, terminal, or computer is restarted), and the signal will be circled around the frame. You can proceed to analyze and activate the next signal. Pressing the Reset button resets all settings to default values. The signal trade is disabled and the frame is deactivated. Pending – input when the price breaks through the Bid of the specified level (by default the High / Low level of the signal bar +/- DefaultLuft items is substituted). Tracking level breakout begins after the signal is formed. Market – entry at the current price. Works for any, incl. unconfirmed, signals. The lot size is calculated automatically based on the remoteness of the point of opening the position and the distance of the stop-loss. 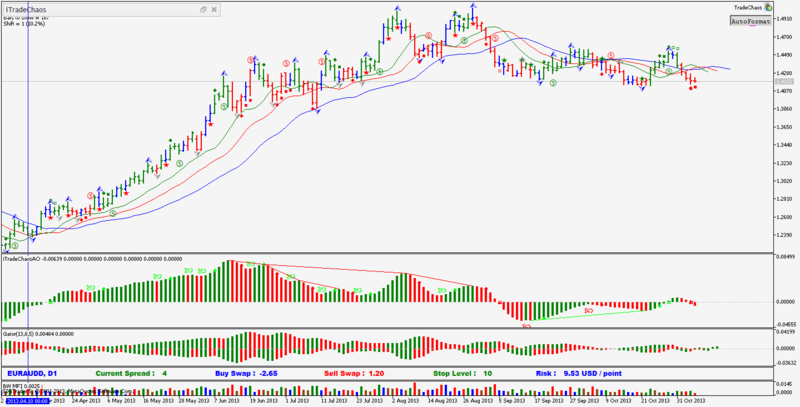 FractalBreakoutLevel – marks the “Change trend” signals on the chart. 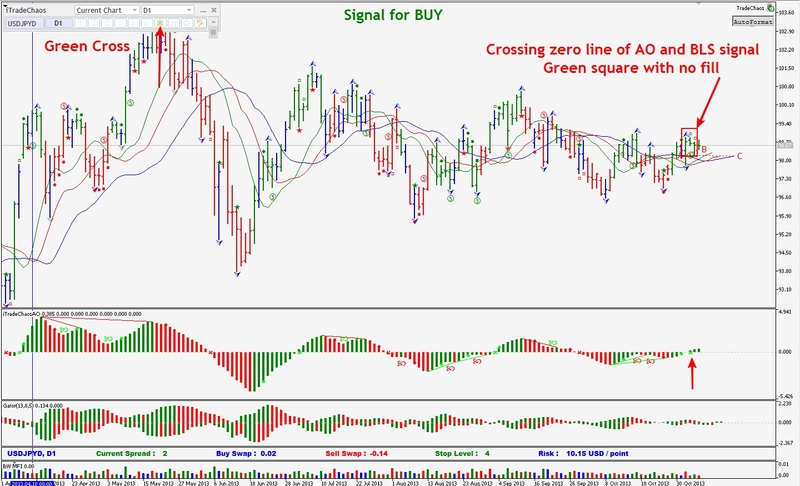 The indicator shows the trader on which direction of the market he should activate his signals. The indicator determines and marks the signal of the “first dimension of the market” – the “phase space”. By connecting the product to the chart, the trader clearly, can the bar that has broken through and closed above (below) the fractal level. On this bar, a blue or red dot is drawn. At the moment of true overcoming of a fractal for buy, the indicator draws a blue horizontal line. If a fractal is broken for sell, a red horizontal line appears on the chart. After receiving this signal, it is recommended to activate market signals from the following four “market measurements” towards the breakdown of the fractal level. See the figure. AlligatorModified is an improved Alligator indicator that determines the moments of a real intersection, rather than the interlacing of balance lines. This is clearly visible on the chart due to the appropriate marking. The main function of the indicator is to filter the “first dimension” signals – breakdowns of fractal levels. If, after the breakdown of the fractal level, the horizontal line is above the Alligator’s “Dental Line” and there was no earlier “Divergent reversal bar”, then such a fractal breakdown, as a rule, does not lead to a market start a trend. Correction of more possible. Refer to the following figure. The histogram is above the zero line, the histogram is green – prices are prone to growth. Positive zone. It is recommendedto buy. The histogram is above the zero line, the histogram is red – prices slow their growth, move in the side. Soon, there may be a reversal of the trend direction. A reverse is especially probable, if before there was a “Two Peaks” signal and a divergence of the price. The histogram is below the zero line, the histogram is red – prices tend to fall. Negative zone. Sell recommendation. The histogram is below the zero line, the histogram is green – prices slow down, they move in the side. Soon, there may be a reversal of the trend direction into a bullish one. A reverse is especially probable, if before there was a signal “Two Peaks” and a divergence of the price. If each successive peak (low) of the histogram is smaller (larger) than the previous peak (cavity), you should expect a price turn. The three basic rules for using the Awesome Oscillator (Awesome Oscillator) in calculating Elliott waves. To determine the peak of the 3rd wave of any order on any period. Wave 3 will have the highest peak on the AO of 100-140 bars. 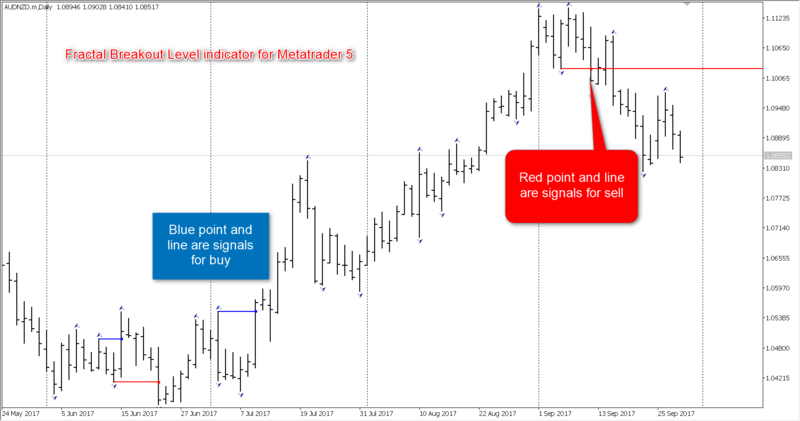 See the pictures with trading signals and the chart with the indicator connected. To determine whether there is a divergence between price and momentum, and to show what is now the value of the momentum of the market. ModifiedAccleratorOscillator – marks the trading signals of the AC indicator. The panel does not define trading signals from this indicator. However, it is used in determining the most important signal of “Zonality” – “The Fourth Dimension of the Market”. 5thDimension – indicator of the “fifth dimension” of the market. It searches for “the fifth dimension” signals on the chart and marks them. TradingChaosChart – The indicator is very similar to the product of Bill Williams in the trading platform CQG. The main functions of the indicator are: Definition and marking on the chart of SQUAT “squatting”, divergent, reversal bars. Determination of angulation, construction of angular rays from the balance lines to the “The first wise man” signal bar. Staining of price bars in accordance with the color of the histogram of the AO indicator. The definition and color allocation of “important” fractal levels located above and below the line of teeth of the Alligator indicator. Identification and marking the “Second Wise Man” and “Blue Light Special” signals. 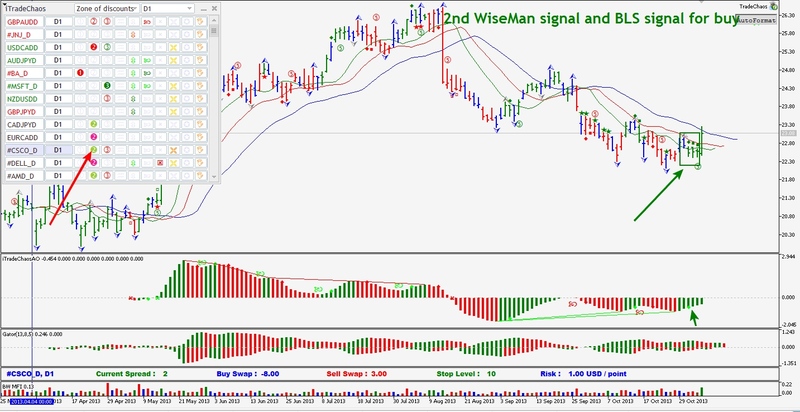 “The First Wise Man” – a signal of a bullish or bearish divergent (reversing) bar (Pin-Bar). The visualization of the “First Wise Man” on the chart is as follows: stars of different colors. For “bearish reversal bars” – a red star, for “bullish reversal bars” – green. 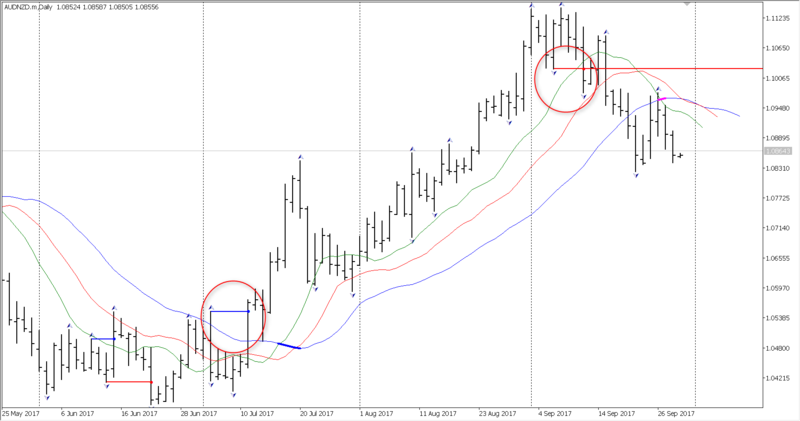 It should be noted that the indicator Trading Chaos Chart (iTradeChaosSE) determines the presence of angulation in bars with signs of reversal. On the points A, B and C, the rays of angulation will be market. This function was invented by me for the first time in the world practice. In accordance with the rules, the “reversal bar” draws rays of angulation. If the angulation is weak, then the lines are dashed, if the angulation is strong, the lines are solid. The divergent reversal SQUAT (squat bar) with angulation and divergence at the end of the 5th wave is a very promising signal for entry into the position. All these signals are clearly visible to the trader on the chart. 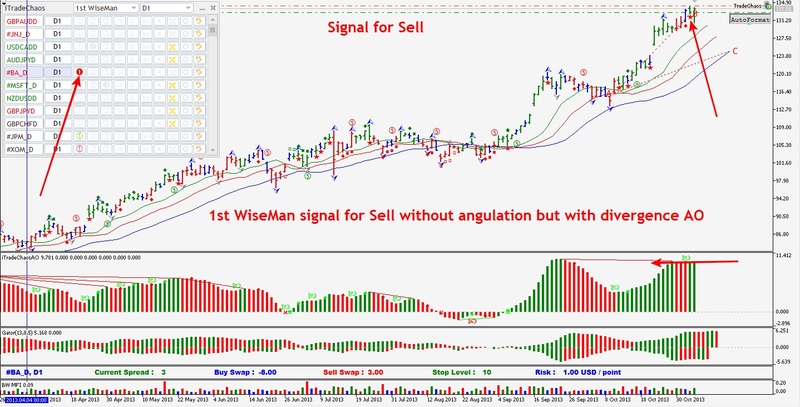 The following figure is a sell “First Wise man” signal with angulation, but without the divergence on the AO. Signals of the “Second Wise Man” and improved signals “Blue Light Special”, on the transition of the histogram AO through the zero line. Marks – diamonds and squares of green and red colors. The following two figures show such signals. The first picture – The signal of the “Second wise man” improved to the signal “Blue Light Special”. “Important fractals” – signals of “The Third Wiseman”. Important fractals are highlighted in blue, usual fractals are gray. SeeFigure. Autoformat – formes the chart for the required number of 140 bars on it. Since with so many bars, you can correctly make wave counting using the Modified Awesome Oscillator indicator. This indicator can reveal a wave of the older period on waves of lower periods. ShortTermExtremums – improved signals of local extremums. I called them Push and Revers signals. If the signal is formed within a trend, then it should be considered as a push of prices towards the trend. If the signal is against the trend, then it should be consideres as a reverse signal. ModifiedBollingerBands – changes the colors of the Bollinger MAs at moments of breakdown volatilities. In the trading panel, this signal is called “Channel Breakout”. The chart with the indicators mentioned above and saved in the default template will look like this. See the figure. After creating the chart template, turn on the trading panel. On the chart with any trading instrument, press “Hot Keys” Ctrl + 1. The panel will be displayed in the upper left corner of the chart. Within a few seconds, the trading signals that are currently available on the market for all instruments displayed in the Market Watch will be searched. After that, the panel will show an information table with trading signals on the daily range, set by default. We will assume that everything is set up and we can start trading. Trading methods and main trading signals. Search for the reference fractured fractals, which led to a change in the trend direction. 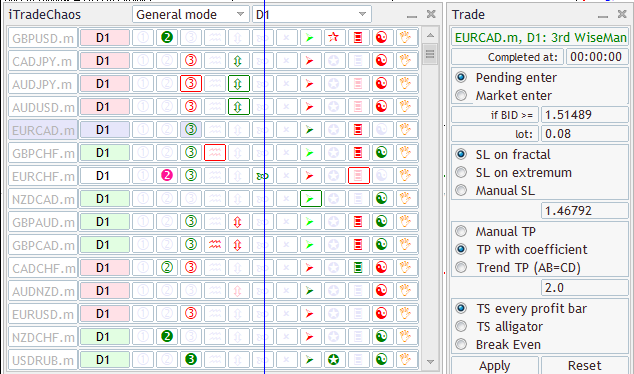 After loading the panel, you will see a table with many icons that correspond to one of the above trading signals that relate to the selected period. By default, the most reliable day period (D1). See the figure.